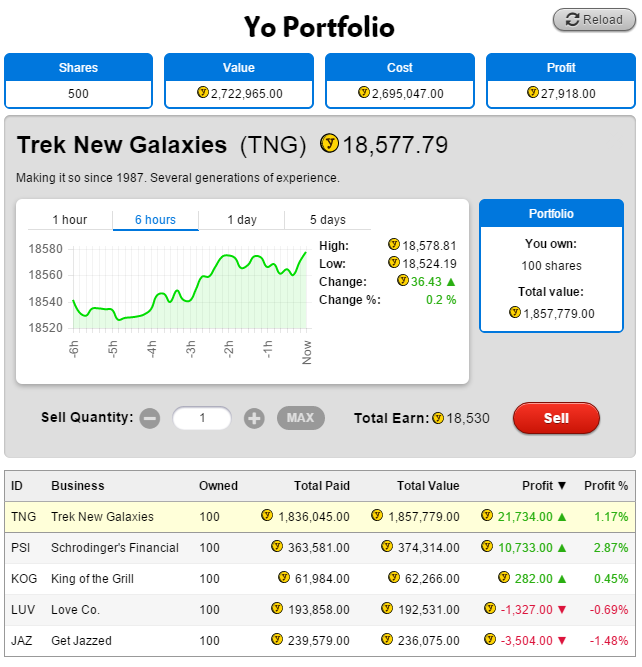 The brand new YoWorld Stock Market is now available. Keep reading for more information on how to use it! 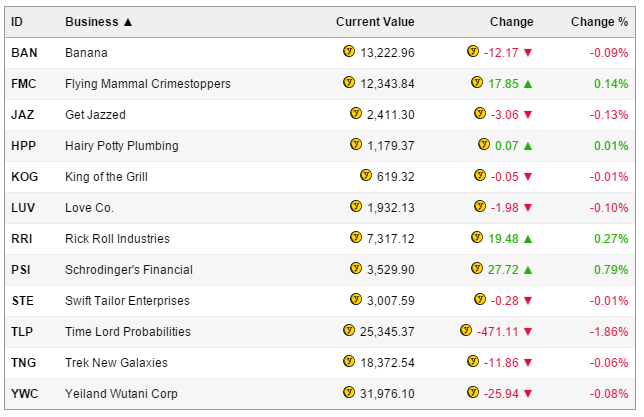 The ticker shows each company's change from the last 24 hours. Use the Market tab to see all available stocks, and the Portfolio tab to see what you own. The Market tab shows you all of the available stocks. From this tab, you can see a stock's current value, and how how much it's changed in the last 6 hours. Click on any heading (ID, Business, Current Value, Change, Change %) to sort stocks by that heading! Click a stock to find more details about it! You'll be able to see a handy graph with its historical values to help you choose which stocks you want to buy. Check on a company's last hour, 6 hours, 1 day, 5 days. or 1 month (once they've been around long enough) to make better investments! The Portfolio tab is similar to the Market tab, but it only includes stocks that you already own. You can own up to 100 shares of each stock at a time. It will also show you the current profit that you would make if you sold your stocks right then. But remember! There is 0.25% transaction fee per sale of shares (a minimum of 10 YoCoins). The "Total Value" column is before the fee, but the "Total Earn" value (next to the Sell button) is after the fee. Make sure that Total Earn is more than you paid for your shares to profit! The idea is to buy shares when the value is low, then sell when the value is high! Any stocks you buy come with a risk, because stocks can lose value too... Decide how much you want to risk, and you could make lots of YoCoins if you're a savvy investor! Oh so we don't just earn coins? We have to sell it to earn? PLEASE CAN WE HAVE A EUROVISION THEME? I'm not so sure about the new update. But I'll give it a try. One more thing, can you guys make like a tutorial on how to make a siggy for the forum? I don't know how to make one lol. Jess, i'm a tad confused by the 0.25%. So, it's 0.25% PER stock? How could you possibly lose money that way? Location: Opinions are like butts, mine is nicer. I still really need explanation on how to buy and how to sell. Its my first time but im really interested to get to know. They do it in real life but i have no clue what it is about but i hear it can really make one big if you get to know how to invest. Please someone tell me more, when and how to buy n sell. The fee applies to any sale of shares, and it's calculated at 0.0025 times the total value of the shares you're selling (or 10 YoCoins). If the value went up by less than that, then you could potentially lose YoCoins because of the fee. In practice, just make sure the "Total Earn" when you're selling your shares is more than the "Total Paid" to make a profit! Ok all, I did some research and I found a little bit of info that might help. Of course since this is not a real stock market it won't be as reliable but I found some things that might hold true in "Our Yo Stock World" minus the stuff that was irrelevant like buyers and stock charts because as Jess says it's just a program and us buying has no relevance on the stock. Anywho. I'm going to try what it suggests Good Luck all! 1.Buying at the right time is essential to successful investing. 2.Don't buy everything at once. If the market takes a downturn right after you buy, you could lose most of your investment. Instead, spread out your initial investment over several months to minimize the risk each time you buy. 3.Check to see if the stock trend is rising. This means that the price has been increasing steadily. Look for stocks that are increasing but not necessarily rapidly. Stocks will only go so high, so if a price is climbing rapidly, there's a good chance that it will level off or drop soon. 4.Find the moving average of the stock. The moving average is the average price of a stock over time. 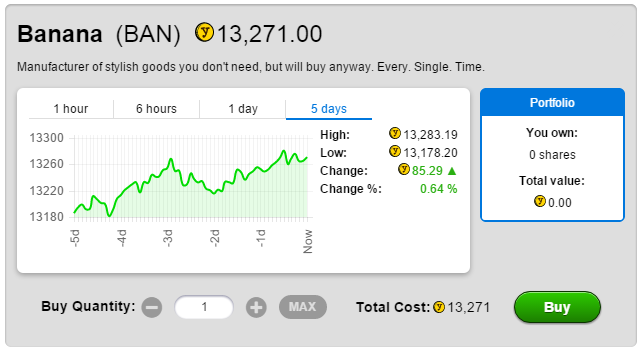 Ideally this average would be increasing and the listed price would be above this average. Avoid volatile stocks. If the price jumps too much, and there are a lot of spikes in the chart, the stock is probably too unstable to safely invest in. Ok this might sound completely stupid but I'm so confused; I know you're supposed to buy stocks low and sell high, so that's what I did. For instance, I bought a stock at 3000 coins, and the little green thing was in the plus and said it went UP, yet if I were to sell it it'd only give me 2850....so what's the point if when I'm supposed to make money I'm not? is this maybe a glitch or something? Did BVG make fake Company names? Yes but I imagine they had inspiration from somewhere, or maybe someone? I invested, and had to wait three months to make profit of 5k. wont do that again! Can someone help me out with the stocks stuff, I still don't get it I was use to having YoVille around, but BVG made it cool but confusing for me. Thank you though for all the things you have done to make YoVille or YoWorld whatever you wanna call it better.